I have been posting on my own website and blog, http://www.bwrensink.org, and when relevant to borderlands history I will begin cross-posting here. Here is the most recent relevant post. Periodic musings on books I like. Only once in my life as a historian has a book recommendation given to a friend actually turned out well. It was a couple of years ago, and a good friend of mine asked that I suggest a book he could give his father for Christmas. I had just assigned the book for an undergraduate course on the pre-1900 U.S. West and students ate it up. I loved Reséndez’s much-praised first book, Changing National Identities at the Frontier: Texas and New Mexico, 1800-1850, but it was a much denser academic study that I probably wouldn’t suggest as casual reading to my friend or his father. Is well-written in engaging prose. Points 2 and 3 are the real kickers for suggesting books to friends and family. There are plenty of amazing academic books that won’t appeal to general readers. Likewise, there are plenty of popular books that don’t quite stack up as “academic” well-researched scholarship. When people ask for suggestions, as a historian I can’t give them a popular title that is based on shoddy scholarship. But, I know that giving them a well-research, but dense, tome won’t serve any better a purpose. A Land So Strange was a perfect fit. And, from what I hear – his father loved it! So – here’s the story. In 1527, Álvar Núñez Cabeza de Vaca was a member of an expedition led by Pánfilo de Narváez. Zzzzzzz, right? Well, don’t tune out yet. The expedition was supposed to sail WEST to colonize on the Eastern coast of modern-day Mexico – between the Rio de Palmas and Rio Grande rivers’ outlets into the Gulf of Mexico. Instead, they sailed NORTHEAST and made land fall on the Western coast of Florida. True, Florida was also part of the land granted to Narváez (the entire Gulf Coast was), but they were woefully off course. Time to fire the navigator. The expedition struggled in Florida, and met full disaster when it was decided to strike inland. Long story short – most of them died. A few made rafts and tried working their way West along the Gulf Coast, and more died. 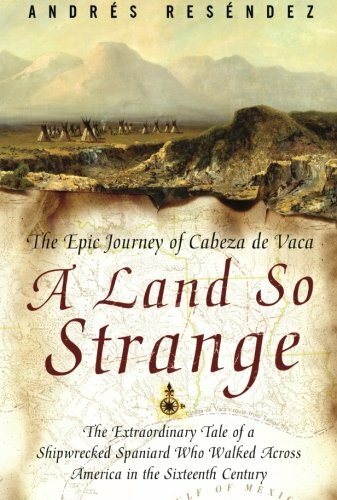 Eventually, only Cabeza de Vaca, Alonso del Castillo Maldonado, Andrés Dorantes de Carranza, and a Moraccan slave named Estevanico (or Estaban) were left. They were captured by Natives, and spent the next EIGHT YEARS being traded between different tribes, until they escaped and made their way down into Mexico – showing up one day dressed like Natives, haggard, with huge beards…and speaking perfect Castillian Spanish. The 4 had walked from Florida to Mexico, learned a number of indigenous languages, and survived hellish conditions, enslavement and starvation. Seriously, the story is nuts. In any case, it is worth picking up. Again, it is a fascinating story, it is well-researched, and it is well-written. What more could you ask? Oh, and dude’s name is Cabeza de Vaca!